Experience some of Europe's wildest natural beauty and most ancient Christian sites. Tour the strikingly situated Great Blasket Centre, a close-up look at the language, literature, and traditional Gaelic Blasket community. Walking tour of Dingle Town, learning about its seafaring heritage, rich history, and perhaps a bit of local gossip. Tight on time? The Heart of Ireland in 8 Days — Rick's personal "best of" distillation of our two-week Best of Ireland tour — starts in Ennis (just down the road from Shannon Airport) and ends in Dublin. Each day along the way, in the good hands of your Rick Steves guide and local experts, you'll be amazed at all you'll experience in a mere week of touring the Emerald Isle: must-see historical sites, charming towns, music-filled pubs, artisan visits, and walking tours — including the Rock of Cashel, the Cliffs of Moher, Ennis Friary, Adare Village, Dingle Town, the Dingle Peninsula, the Great Blasket Centre, the Brú na Bóinne archaeology site, crystal cutting, whiskey tasting, and more. Join us for the Heart of Ireland in 8 Days! We'll gather together at our hotel at 2 p.m. for a meeting. Then we'll take an orientation walk around Ennis, beginning with a tour of the Friary. Afterward we'll get to know one another over a hearty "Welcome to Ireland" dinner together. This evening we'll meet one of Ireland's preeminent storytellers, or seanchaί, who will tell us tales of Ireland's magic, myth, and mystery. Sleep in Ennis (1 night). No bus. Walking: light. After breakfast we'll pack up and board our comfy bus, setting course for Ireland's Dingle Peninsula. En route we'll stop to visit the dramatic Cliffs of Moher, where you'll find yourself leaning into the wind, teetering on the very edge of Europe, more than 600 feet above the churning waters of the North Atlantic and County Limerick's lovely village of Adare. 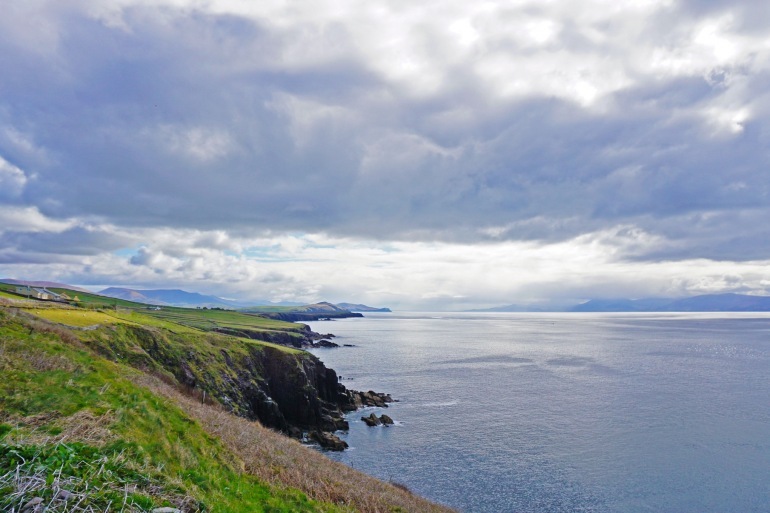 At the end of our drive we'll arrive in the pastel-painted, quintessentially Irish harbor town of Dingle. Tonight we'll enjoy a gourmet dinner of local specialties at our guesthouse. Sleep in Dingle (3 nights). Bus: 5 hrs. Walking: light. It's a great day to experience some of Europe's wildest natural beauty and most ancient Christian sites. We'll start our day with a crystal cutting demonstration from a master craftsman, then hop aboard our bus with our local expert to follow the famous Slea Head Drive, our vote for the most beautiful road in Ireland. We'll stop to tour the strikingly situated Great Blasket Centre, where we'll get a close-up look at the language, literature, and daily life of a traditional Gaelic Blasket community. Working up a thirst, we'll find relief with an Irish whiskey tasting. Following free time to soak in more of Dingle's charms and enjoy dinner on your own, we'll rendezvous for an intimate evening of Gaelic tunes. Bus: 3 hrs. Walking: light. This morning we'll have a lively walking tour of Dingle Town, learning about its seafaring heritage, rich history, and perhaps a bit of local gossip. After lunch on your own and time to explore, we will see Dingle from another angle and hopefully meet its famous dolphin, Fungie, as we take a boat cruise around Dingle Bay. Your evening is free, so no doubt you'll return to Dingle town with a pub in mind, ready for as much dancing and singing with new friends as you can handle. No bus. Walking: light. Today we'll bid goodbye to Dingle as our bus transports us across the Emerald Isle to Dublin. On our way we'll stop to tour one of Ireland's most historic and evocative sights: the Rock of Cashel. St. Patrick himself was here more than 1,500 years ago, and ever since, the Rock has been the spiritual heart of Ireland. From the craggy remains of the cathedral and castle to the views stretching out across the Plain of Tipperary, this is where the Irish in you will stir from head to toe. Upon arrival in Dublin we'll stretch our legs with a neighborhood orientation walk, followed by dinner together. Sleep in Dublin (3 nights). Bus: 6 hrs. Walking: strenuous. This morning we'll take a walking tour through Dublin, learning about its often calamitous history, from the days of Viking raids to the hard centuries of British occupation, to its remarkable literary legacy, to the modern city of today. We'll end at Trinity College for an illuminating look at the remarkable Book of Kells, a jolt of Irish creativity that helped pull Europe out of the Dark Ages. The rest of your day will be free to take in some of Dublin's other world-class sights, such as the National Museum or Dublin Castle. No bus. Walking: moderate. Today we'll drive an hour out of Dublin to one of Europe's premier archaeological sites: the ancient tombs of Brú na Bóinne. Predating Stonehenge by a thousand years and the pyramids at Giza by 500, these massive "passage tombs" of Newgrange and Knowth are windows into a mysterious, pre-Celtic Ireland, just as it was pulling itself up and out of the Stone Age. This afternoon we'll return to Dublin to tour Glasnevin Cemetery and Museum, the final resting place of more than one million Dubliners, including many of Ireland's national heroes and heroines. Tonight we'll compare notes and celebrate our marvelous week together over a farewell dinner. Bus: 2 hrs. Walking: moderate. Breakfast is provided, but there are no group activities today. You can fly out of Dublin's handy airport, or take the ferry to Wales for further adventures in the British Isles. Your guide will help you with any post-tour planning, leaving you well prepared for the road ahead. Slán leat! Fine print: You are responsible for the cost of your drinks and free-time sightseeing. our tour deposit is 100% refundable for 30 days from the date it is received, unless noted otherwise below. After 30 days your deposit becomes nonrefundable, and will be forfeited should you decide to cancel your reservation. Deposits made 60–90 days before a tour departs become nonrefundable on the final payment due date. If you book a tour less than 60 days before its departure date, the entire tour cost becomes non-refundable after 7 days.